Under the Environmental Impact Assessment Ordinance, the Environmental Impact Assessment (EIA) Report (Register No. 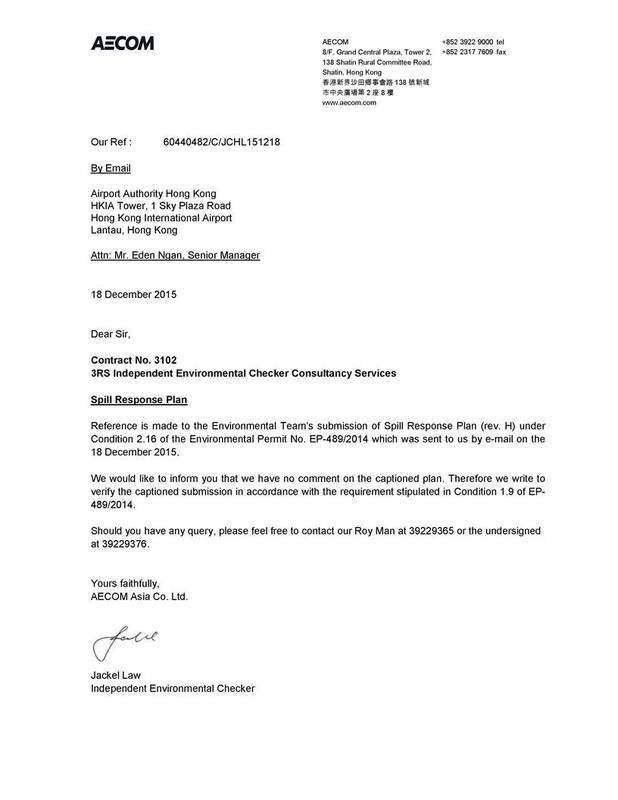 : AEIAR-185/2014) prepared for the “Expansion of Hong Kong International Airport into a Three-Runway System” (the project) has been approved by the Environmental Protection Department (EPD), and an Environmental Permit (Permit No. : EP-489/2014) has been issued for the project. 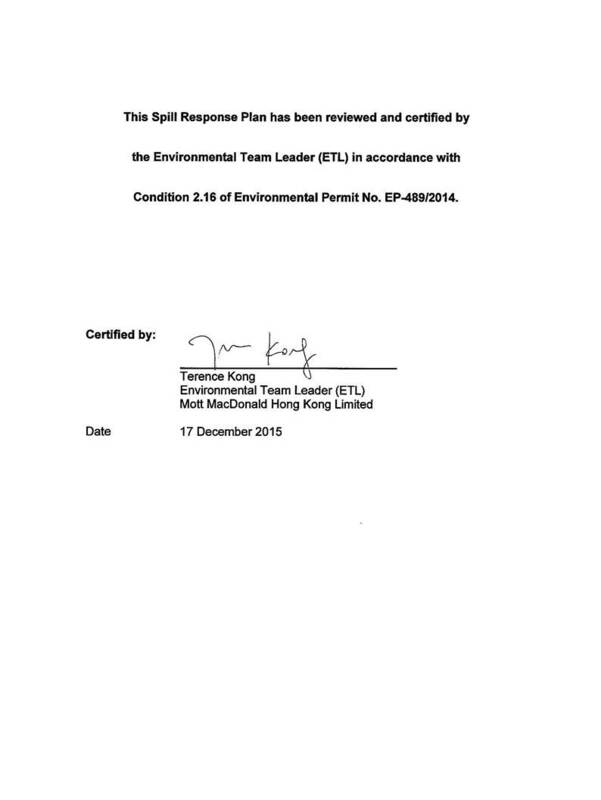 Pursuant to Condition 2.16 of the Environmental Permit (EP), the Airport Authority Hong Kong (AAHK) shall prepare a Spill Response Plan to handling any spillage incidents related to the project. Mott MacDonald Hong Kong Limited (MMHK) was appointed by AAHK to provide environmental consultancy services to establish a Spill Response Plan (SRP) for actions to be taken to protect water quality and marine ecology in the event of accidental spillages associated with the project. This project covers the expansion of the existing airport into a three-runway system (3RS) with key project components comprising land formation of about 650 ha and all associated facilities and infrastructure including taxiways, aprons, aircraft stands, a passenger concourse, an expanded Terminal 2, all related airside and landside works and associated ancillary and supporting facilities. ¡ A contact list of relevant parties to be notified in the event of spills. Regarding the 3RS operational phase, the arrangements for effective emergency preparedness and response to spillage incidents are covered separately in Section 8. Prevention and spillage response actions are the responsibility of Contractors operating in each construction works area. Proposed organisation arrangements for Contractors and the responsibilities of their key personnel during an emergency spill response event are described in this section. AAHK as the project proponent and EP holder will assume overall responsibility for the project. In accordance with EP Conditions 2.2 and 2.3, AAHK will employ a full time on-site Environmental Team (ET) and Independent Environmental Checker (IEC) to implement and verify the environmental monitoring and auditing (EM&A) programme and performance respectively. This SRP details the general arrangements and expectations for spill response preparedness for the 3RS Project. During the 3RS construction phase, the responsibility for spill response is delegated by AAHK to individual Contractors undertaking the various construction works packages. Contractors are required to develop their own individual SRPs based on the specific nature of their works making reference to the general requirements and arrangements specified in this Plan. The ET, acting on AAHK’s behalf, will have the role of checking that individual Contractors develop contract-specific SRPs in accordance with the general and specific requirements, including certifying the contract-specific SRPs and thereafter will ensure that plans are properly implemented as part of the EM&A programme. The IEC will have the role of verifying each contract-specific SRP and thereafter auditing the implementation of the contract-specific SRPs as part of the EM&A programme. Under this SRP and any contract-specific SRPs, the central contact of AAHK will take the responsibility for correspondence with relevant Government Departments in the event of handling all kinds of emergency spillage incidents. The general requirements of the Emergency Team to be provided by each Contractor are presented below. Each Contractor will be required to prepare a contract-specific SRP and establish their own Emergency / Spill Response Team, with details to be included in their individual plans. Individual Contractors shall prepare their contract-specific SRP based on the general requirements specified in this Plan, with further details set out in Appendix A. ¡ Ensure the contract-specific SRP is issued and followed by all construction workers of the project. ¡ Ensure that all construction workers perform their tasks and duties safely and correctly with sufficient resources. ¡ Direct the Emergency Team during any spill event. ¡ Maintain communication with AAHK and other relevant external parties in the event of spillage as mentioned in this SRP. The Emergency Team shall comprise appropriate personnel (such as Safety Manager, Environmental Manager and/or Environmental Officer) to coordinate, monitor and oversee the implementation and performance of the SRP and shall assist the Emergency Team Leader when any spillages occur. The Emergency Team shall liaise with the ET / IEC via the communication channels established by AAHK for the 3RS project. The Emergency Team shall ensure that all construction workers follow the requirements of the contract-specific SRP and shall provide related spill prevention and response training to all construction workers. The Emergency Team shall conduct a spill incident / accident investigation when required, and shall review and update the SRP on a regular basis. The Contractors shall provide full details of the individual personnel comprising their Emergency Team, including individual roles, responsibilities, lines of communication and an organisation chart in their contract-specific SRP. All onsite construction workers are responsible for complying with the SRP and following the instructions of the Emergency Team. All workers are required to attend training provided by the Emergency Team to ensure construction materials, chemicals and wastes are handled and stored properly onsite as required by the EIA and the SRP. Workers are required to implement any remedial actions or environmental protection measures as directed by the Emergency Team, with proper use of the spill kits to collect and store the spillage wastes generated during cleanup of any spills where applicable. Workers are also responsible for reporting immediately to the Emergency Team any incidences that occurred during the site works. Based on the construction phase activities associated with the 3RS project, the key types of spillages that may arise due to the project are summarised in Table 3.1. Further details of these different types of spills are presented below. The main types of the spills that may arise from land-based activities are spillage of fuel / oil and chemicals. Fuels / oils used during operation of powered mechanical equipment or stored onsite may be accidentally spilled due to poor handling practices or when insufficient safeguards are provided. While land-based spills are likely to be confined to the immediate area of the spill, the spill may seep into nearby stormwater drains and discharge into the marine environment if not responded to immediately. Chemicals used during construction phase include construction materials such as bentonite and cement, finishing materials such as paints and coatings, and plant maintenance chemicals such as lubricants and solvents. Similar to fuel / oil spills, spillage of chemicals are likely to be confined to the immediate area of the spill, but may seep into nearby stormwater drains and discharge into the marine environment if not responded to immediately. For fill materials used during construction phase, only accidental spillages into the marine environment are identified as a potential concern. The main types of the spills that may arise from marine activities are spillage of fuel / oil, chemicals and construction fill materials. Similar to land-based activities, fuel / oil and chemicals may be stored onboard construction / working vessels and can be accidentally spilled due to poor handling practices or when insufficient safeguards are provided against unforeseen events such as vessel collision. Any spills into the marine environment can form a large plume quickly due to wave and current action unless it is isolated quickly. Spillage of construction fill materials may arise during transport of the materials to the construction area, and during filling activities for land formation. Spillage of fill materials can form large sediment plumes due to wave and current action unless it is isolated quickly. ¡ Maintain good site housekeeping practices and ensure all materials, chemicals and wastes are properly stored and placed in appropriate disposal areas onsite at the end of each day. ¡ Avoid disorder and storage of unnecessary materials in working areas. ¡ Open flames and smoking shall be prohibited within the construction site; smoking may be permitted only at designated smoking areas. ¡ Stacked containers should be secured from falling. ¡ Large / heavy containers should be stored on the floor as far as possible to prevent falling. ¡ Warning signs, fences and locks where appropriate should be deployed for storage place of hazardous materials, chemicals, fuel and oil, etc. ¡ Bottom opening of barges shall be fitted with tight fitting seals to prevent leakage of material. ¡ Vessels shall be regularly inspected to ensure no leakages and any leakages shall be repaired quickly prior to mobilisation of the vessels. ¡ Barges or hoppers shall not be filled to a level which will cause overflow of materials or pollution of water during loading or transportation. ¡ Excess materials shall be cleaned from the decks and exposed fittings of barges and hopper dredgers before the vessels are moved. ¡ Adequate freeboard shall be maintained on barges to reduce the likelihood of decks being washed by wave action. ¡ Vessels shall follow the pre-defined routes and marine traffic arrangements to minimise the risk of collision. ¡ Vessels shall follow the designated entry / exit points into and out of the construction site boundary. ¡ Vessel speeds shall be limited to 10 knots or less within the construction works area and hotspots of the Chinese White Dolphins (CWDs). ¡ Transits of vessels operating within the construction works areas will be monitored and managed by a Marine Traffic Monitoring System (MTMS) associated with a 24-hour On-shore Control Room, which will be established by AAHK for the project. Details of this MTMS have been stipulated in the separate Marine Travel Routes and Management Plan for Construction and Associated Vessels pursuant to EP Condition 2.9. ¡ Pipes and fittings connecting the barges with the spreaders shall be properly fitted and checked for leakages / loose fittings prior to transferring any fill materials. ¡ Pipes shall be sized according to the required pumping rates and the pumping rates shall not exceed the pressure limits of the pipes / connections. ¡ During marine excavation activities for the submarine 11kV cable field joint excavation, and piling activities for the runway approach lights and Hong Kong International Airport Approach Area marker beacons, only closed grabs designed and maintained to avoid spillage shall be used and should seal tightly when operated. ¡ Label all chemical storage containers and tanks in accordance with the EPD ‘Code of Practice on the Package, Labelling and Storage of Chemical Wastes’. ¡ An up to date list of chemicals, chemical waste and fuel oil should be maintained. ¡ Suitable containers should be used which are resistant to the stored oil fuel, chemical / chemical waste to avoid leakage. ¡ Containers should be checked before use and container lids should be closed tightly to avoid leakage of chemicals and chemical waste. ¡ Chemical waste storage areas should be located in a designated area that is sheltered on at least 3 sides and the top, and is locked and kept clean and free from obstruction. ¡ Incompatible chemicals should be separated. ¡ Chemical, oil and fuel containers should be kept under eye level as far as possible. ¡ Drip trays or bunds should be used for storage containers of chemicals and oil / fuel tanks and should have a capacity equal to 110 % of the storage capacity of the largest tank. ¡ Chemical storage area and drip trays should be inspected daily to ensure the containers are in good condition and there are no openings which oil / chemicals can possibly leak out. Any damage / openings to the storage area and drip trays should be repaired or replaced immediately. ¡ Where chemicals are temporarily taken outside the sheltered chemical storage area, the chemicals including the drip trays / bund should be covered by waterproof tarpaulins and kept free of rainwater. ¡ Pumps should be used to transfer large quantities of oil, fuel, chemical / chemical wastes instead of pouring. ¡ Oil, fuel, chemical / chemical wastes should be transferred slowly to prevent spillage or overfilling. ¡ Suitable trolley should be used to transport chemicals / chemical wastes to other location. ¡ Chemical quantities / dosage required during each use shall be carefully calculated / measured to prevent any excess chemicals being generated and released. ¡ Drilling fluid used in drilling activities should be reconditioned and reused as far as possible. In the event of a spillage incident, the spill response needs to be carried out promptly and efficiently according to the spillage location, type of spill and quantity of spill. An effective spill response can prevent adverse impacts to the environment and may also minimize the quantity of release into the environment. The spill responses for different spillage types and scenarios are discussed in the following sections. ¡ The approximate quantity and size of the spill. For chemicals and hazardous materials, the name of the chemical / hazardous material should also be identified and reported immediately as part of the emergency communication. After receiving the description of the spill from the workers, the Emergency Team shall proceed with the appropriate spill response according to the relevant scenario described below. 1. Workers shall take immediate measures (in line with spill response training) to stop the source of the spill if the source is obvious and it is safe to do so, and inform the Emergency Team of the spill incident. 2. Emergency Team Leader / Members shall organize the manpower to identify / check the source of the spill and provide instructions for stopping / containing the spill. 3. Workers shall stop, reduce, isolate or contain the spillage if possible measures can be taken (e.g. turn off the valve). 4. In parallel, the Emergency Team Leader shall inform all relevant parties such as AAHK, ET and IEC immediately and keep such parties informed throughout the spill response. 5. If the spill spreads to an area larger than 100m2, the Emergency Team Leader shall also inform all relevant authorities such as EPD and Fire Services Department (FSD) immediately, and keep such parties informed throughout the spill response. 6. Workers shall install forced ventilation to ensure a safe spillage response condition is provided, where applicable. 7. Emergency Team shall appoint well-trained cleanup crew to cleanup the spillage area. 8. Emergency Team shall review relevant Material Safety Data Sheet (MSDS) for the chemical spill. The MSDS would have specific instruction on how to deal with chemical spill. 9. Emergency Team shall ensure all the workers involved in the cleanup works are equipped with suitable personal protective equipment (PPE). 10. The spilt material shall be put back into the containers of origin if possible and practical. Otherwise, dry sand, sawdust or other suitable materials shall be used to absorb the spill. 11. Any contaminated materials shall be collected, bagged and clearly marked as “Chemical Waste”. 12. All collected chemical waste shall be stored in a designated chemical waste area and handled and disposed of in accordance with the Waste Disposal (Chemical Waste) Regulations. 13. Emergency Team shall carry out spill investigation and complete the spill incident report. 2. The ET and Emergency Team shall carry out joint spill investigation and complete the spill incident report with provisions for improvement measures / practices to prevent re-occurrence and update this SRP if necessary. The improvement and prevention measures/practices should be recommended to AAHK. Site staff shall be briefed of these measures by the Emergency Team after the investigation. When oil or other hazardous materials are spilt into the marine environment, the spill could be spread out quickly due to the water current and wind speed. Therefore, a timely and effective spill response shall be implemented in order to minimize the impacts to the marine environment. 3. Workers shall stop, reduce, isolate or contain the spillage if possible measures can be taken (e.g. deploy containment booms). 5. If the spillage spreads to an area larger than 100m2, the Emergency Team Leader shall also inform all relevant authorities such as EPD, Marine Department (MD), Agriculture Fisheries and Conservation Department (AFCD), and Fire Services Department (FSD) immediately, and keep such parties informed throughout the spill response. 12. Emergency Team shall carry out spill investigation and complete the spill incident report with provision of improvement and prevention measures recommended to AAHK. Site staff shall be briefed of these measures by the Emergency Team after the investigation. 1. Follow item nos. 6 to 11 of the procedures for spill responses for spillage area less than 100m2. 3. The ET and Emergency Team shall carry out joint spill investigation and complete the spill incident report with provisions for improvement measures / practices to prevent re-occurrence and update this SRP if necessary. The improvement and prevention measures/ practices should be recommended to AAHK. Site staff shall be briefed of these measures by the Emergency Team and such measures shall be included in future drills and exercise. 4. A report of the spillage incident, including the investigation report and recommended improvement measures should be provided to EPD. 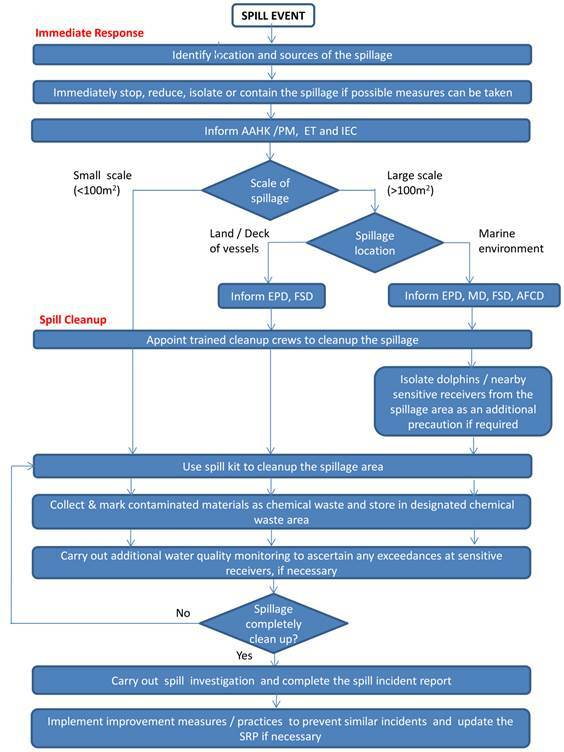 The overall process for oil and hazardous chemicals spill procedures is presented in Figure 5.1. According to the EIA, with the implementation of the required mitigation measures for SS release (which includes using non-dredge construction methods, deployment of silt curtains, control of fines content and production rates, etc.) the potential for adverse water quality impact due to SS release during construction phase is considered to be insignificant. 10. The Emergency Team shall assist the ET to prepare a spill investigation report to identify the cause / reason for the spill and the improvement measures / practices to prevent re-occurrence, and update this SRP if necessary. CWDs are commonly found within western waters of Hong Kong. If a spill of oil / hazardous chemicals occurs in the marine environment and spreads over a large area, the health and wellbeing of CWDs might be endangered. As such, a Dolphin Contingency Plan shall be implemented for large scale oil / hazardous chemicals spills released into marine environment. c. Absorption materials such as pads or pillow to cleanup the spillage as soon as possible. 5. The dolphin observers shall maintain watch of the spillage area until the spill is completely cleaned up. If dolphins are found to be entering into the contained spillage areas, the Emergency Team Leader / Emergency Team shall contact the ET and seek their advice for appropriate actions. 1. The Emergency Team shall implement all possible mitigation measures in order to isolate the spill and minimize any potential adverse impacts to the sensitive receivers. 2. The Emergency Team Leader shall immediately inform the relevant parties as mentioned in Section 5.2. 3. Potentially affected sensitive receivers such as seawater intakes, ecological sensitive receivers, fisheries and fish culture zones, corals and bathing beaches shall be identified by the ET. 4. The Emergency Team Leader shall immediately implement any at receiver mitigation measures as requested by the AAHK based on the ET / IEC’s recommendations. This may include deployment of absorbent booms or other similar booms in order to surround and protect the sensitive receivers. 5. The ET shall implement additional water quality monitoring if necessary to determine any potential adverse impacts to the sensitive receivers and the need for any further mitigation measures. 6. The Emergency Team Leader shall implement any further mitigation measures as requested by the AAHK based on the ET / IEC’s recommendations. 7. The ET shall continue to monitor the impacts at the sensitive receivers until the spill is completely cleaned up and there is no further adverse impacts to the sensitive receivers (as confirmed by water quality monitoring results). There are no neighbouring residents (i.e. non-airport operations related personnel) located within or immediately adjacent to the 3RS project area that may be affected by spillage events arising from construction of the 3RS project. Hence no specific provisions for protecting neighbouring residents are required. All construction site workers shall be introduced to the SRP during the environmental induction training and Tool Box talks which should be carried out by the Contractors for each construction site. During the induction training and Tool Box talks, a demonstration of the containment methods and equipment shall be carried out. The Contractors shall conduct Tool Box talks with the site workers regarding the SRP periodically. Examples of spill related training topics are shown in Table 6.1. The Tool Box talk training material prepared by the Contractors should be submitted to AAHK and reviewed by the ET, and the Contractors should update their materials regularly, if required. The Emergency Team Leader shall ensure that all relevant workers receive the appropriate spill related training prior to undertaking activities that may lead to spillage or involve spill response. A training record shall be maintained by the Contractors to register the training provided and each individual’s signoff to acknowledge that the training has been attended and the content is understood. The training record should be made readily available to the ET and IEC for checking and auditing. Refresher training shall be provided regularly and all relevant workers shall attend and signoff subsequent refresher training at least once every 3 years. Training arrangements for dolphin observers will be detailed in the Marine Mammal Watching Plan under EP Condition 2.11 and a separate Dolphin Exclusion Zone (DEZ) Plan. ¡ Diagram of the site plan, including drainage plan of the site and the airport facilities. Regular (at least quarterly and after each spillage event) inspections and stocktaking of the resource materials in the spill response kit should be taken by the Emergency Team. Regular (at least annually) checking and testing of the functioning and validity date of the resource materials should also be carried out by the Emergency Team. Regular drills would be carried out to ensure all site workers, especially the Emergency Team members, are proficient in his/her assigned duties. Where applicable, spill incidents will be simulated, drilled and practiced at least annually. After commencement of works, Contractor shall provide the drill schedule to AAHK, ET and IEC for audit. Relevant parties including AAHK, ET and IEC, and relevant authorities such as FSD, MD, AFCD and Police would be invited to participate and/or witness the drill exercises. A full investigation report of the spillage incident shall be submitted to AAHK, ET and IEC within 2 weeks after the incident occurred. In addition to the details of a draft incident report, the full report will investigate the reasons for the spillage and evaluate the effectiveness of the procedures and precautionary measures taken and specified in this SRP. Where applicable, additional mitigation measures will be proposed and implemented to prevent similar occurrence of spillage. The SRP should be maintained as an easily accessible document onsite as well as in the AAHK’s project office including the office of AAHK’s contact point. Previous spillage incident reports and recommendations should also be kept for reference in case of similar spillage events. All records of self-inspection, checking and testing, drills, and response training should be kept for record and reference. The spill response procedures in this SRP should be reviewed after every spill incident and/or spill response drill, and at least annually, and relevant procedures and measures shall be updated as required. The following tables (Table 7.1 - Table 7.4) provide the names and telephone contacts of various parties who should be contacted in case of a spill incident or emergency. China Light and Power Co. Ltd. The emergency contact list shall be reviewed at least annually. Any changes should be amended and notified to all onsite staff immediately. In line with the EIA, AAHK is committed to maintaining the same level of spill prevention and spill response as is currently in place under the 2RS operations. This operational phase spill response plan is therefore based on existing spill response procedures in place for the 2RS and these are considered to be valid and applicable. Nevertheless, it should be noted that the final arrangements for the 3RS operational phase spill response are subject to confirmation before commencement of 3RS operations, for example to allow incorporation of details and final arrangements from the detailed designs for 3RS buildings and infrastructure. Therefore, the operational phase SRP will be further updated for it to be ready for use upon commencement of full 3RS operations. ¡ Records of annual review of staff trainings on emergency response handling for relevant airport staff. The 3RS Operational Emergency Spill Response Plan shall be updated prior to commencement of full 3RS operations and regularly reviewed and updated thereafter by AAHK. Details of the operational phase spill prevention and response procedures are as follows. During the 3RS operational phase, AAHK and/or AAHK’s term maintenance contractor(s) / tenants will be the primary responsible parties for implementing spill prevention and response. Table 8.1 summarises the key roles and responsible tasks of the main parties involved in HKIA spill response. Receive reports of fuel / chemical spillage occurring within airport premises and obtain details of the incident. Alert the relevant AAHK Incident Coordinator to mobilise on scene. Alert all other relevant parties including other AAHK Departments / personnel, other Tenants / Airport Operators, and Government Departments where applicable. On scene liaison with all parties concerned. Monitor response activities to ensure the spill is controlled and contained. Ensure precautionary measures taken by the party responsible for the fuel / chemical spillage to prevent the spill from entering into the storm water drainage system. Liaise with party responsible for the fuel / chemical spillage regarding disposal of the spilt material and subsequent cleanup of affected areas. Liaise with all parties concerned to agree / confirm closeout of the incident / accident. Maintain a log of events and actions taken. Upon request by the AAHK Incident Coordinator, provide service to contain and clean up the spilt material. Activate contingencies to prevent spilt material from entering the marine environment, if required. Immediately stop the fuel flow and notify the Line Maintenance Franchisee and AAHK of the spill. Contain, control and clean up the affected area if the spill is less than 20 litres and not of a running nature. Coordinate with the Line Maintenance Franchisee for containment, control and cleanup of major spills (spills greater than 20 litres or of a running nature). Maintain communication with the AAHK Incident Coordinator. Notify AAHK of the spill. Provide technical management of the spill and support to the AAHK Incident Coordinator including assessing whether the spill is minor or major. For major spills (spills greater than 20 litres or of a running nature), make arrangements to stop the fuel spill. Coordinate with the AAHK Incident Coordinator and provide response to contain and remove the spilt fuel. Maintain a log of events and actions taken and submit initial report to AAHK. Establish own response plans and procedures for dealing with fuel / chemical spills. Provide immediate action to stop, contain and remove any spilt material if it is safe to do so. Report and provide details of the incident to AAHK. 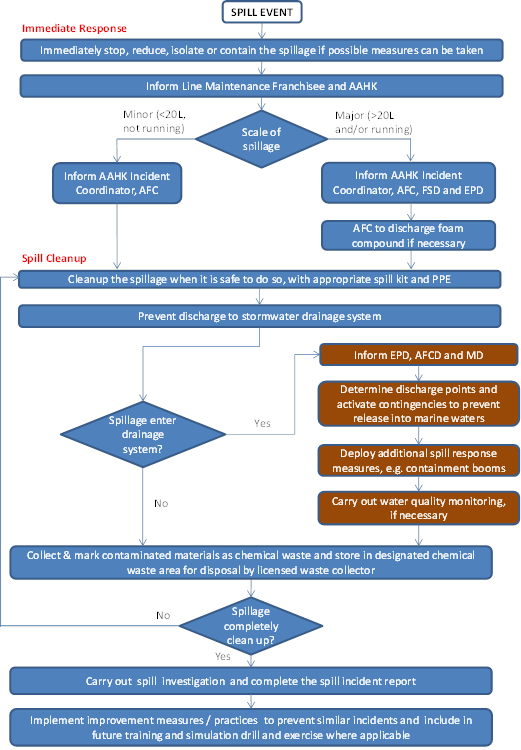 Follow own spill response plans and procedures as well as the advice of the AAHK Incident Coordinator for spill response and cleanup. Regarding the potential for spillage of aviation fuel from storage and delivery activities, these are the responsibility of the aviation fuel supply companies and the existing established procedures shall be followed. 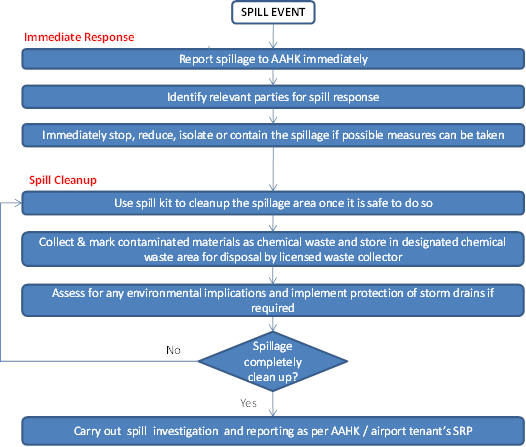 Based on the operational phase activities associated with the 3RS project, the key types of spillages that may arise due to the project are summarised in Table 8.2. Fuels used during aircraft fuelling operation and other fuels / oils used during operation of vehicles / plants or stored onsite may be accidentally spilled due to poor handling practices, leaking fuel delivery equipment or when insufficient safeguards are provided. While such land-based spills are likely to be confined to the immediate area of the spill, the spill may seep into nearby stormwater drains and discharge into the marine environment if appropriate response actions are not taken quickly. Chemicals used during operational phase include plant / facilities cleaning and maintenance chemicals such as lubricants and solvents. Spills are likely to be confined to the immediate area of the spill, but may seep into nearby stormwater drains and discharge into the marine environment if appropriate response actions are not taken quickly. During the operational phase, no fill materials will be required, and there will be no marine-based activities associated with the 3RS project. Hence spillage of fill materials from marine based activities is not envisaged during the operational phase. ¡ An aviation fuel system emergency shutdown valve shall be available at readily accessible positions at aircraft parking stands and on all refuelling vehicles. ¡ The aircraft, refuelling vehicle, hose coupling or nozzle, filters, tunnels or any other appliance through which fuel passes, shall be effectively bonded to each other before filler caps are removed, and shall not be disconnected until the filler caps have been replaced. ¡ Cable, clips and plugs for bonding shall be kept in good condition without signs of damage or cracks. ¡ Only qualified personnel acquiring adequate training on refuelling operation shall be permitted to operate the refuelling equipment and to ensure that the fuel flow is cut off quickly in the event of emergency. ¡ For defueling operations, the amount of fuel in the bowser fuel tank should never exceed 80% of its capacity at all times. The refuelling in-charge should closely monitor the defueling quantity to ensure the volume of fuel transferred to the bowser will not exceed the 80% capacity limit. For other chemicals, oils and fuels required and used onsite, the measures specified in Section 4.3 are also relevant and shall also be applied where applicable. During the operational phase, there are two distinct types of spill response procedures which will be applied depending on the types of spill, i.e. those related to aircraft fuelling activities, and those not related to aircraft fuelling activities. The spill response procedures to be effected in either case are described below. 8. The AAHK Incident Coordinator and AAHK’s Emergency Team shall carry out a spill investigation and complete the spill incident report with provision for recommending additional improvement and prevention measures, if applicable. The final report shall be made known to the relevant operational staff (e.g. staff responsible for spill response and clean up) and included in the future training and simulation drills and exercises if applicable. 9. The Line Maintenance Franchisee shall prepare an initial report of the event and actions taken and submit to the AAHK Incident Coordinator. The AAHK Incident Coordinator and AAHK’s Emergency Team shall carry out a spill investigation and complete the spill incident report with provision for recommending additional improvement and prevention measures. The final report shall be made known to the relevant operational staff (e.g. staff responsible for spill response and clean up) and included in the future training and simulation drills and exercises if applicable. The overall process for aircraft fuel spill procedures is presented in Figure 8.1. 8. If the spilt material enters the airport drainage system, AAHK will activate contingencies to prevent it from entering marine waters including shutting the penstocks (outfall gates) at relevant outfalls(s) if required. AAHK will also inform EPD, AFCD and Marine Department. The overall process for other fuel / chemical spill procedures is presented in Figure 8.2. It should be noted that for fuel / chemical spillages within Airport tenant controlled premises (i.e. premises not operated by AAHK), the procedures for dealing with such spillages are as laid down in the tenant’s own spill response plans and procedures. However, tenants are required to report any such spillage incident / accident to AAHK and the AAHK Incident Coordinator will monitor the tenant’s response and coordinate and provide any necessary support to the tenant’s response activities as required. In the unlikely event that a spill of oil / hazardous chemicals enters the marine environment and spreads over a large area, water quality and marine ecology sensitive receivers including Chinese White Dolphins (CWD) may be adversely affected. ¡ Restricted operation of fuel supply and refuelling systems to qualified and trained personnel with adequate knowledge of spill response procedures. 1. The AAHK Incident Coordinator shall determine the discharge points of the spill based on the airport drainage plans and provide instructions to activate contingencies to prevent release into marine waters by shutting the penstocks (outfall gates) at relevant outfalls(s). 2. In parallel, AAHK will inform EPD, AFCD and Marine Department. b. Absorption materials such as pads to cleanup the spillage as soon as possible. 4. At the advice of EPD / AFCD, water quality monitoring to detect the presence of the spilt substance(s) may be implemented by AAHK at the affected outfalls if necessary to determine any potential adverse water quality impacts to the marine environment and the need for any further mitigation measures. 5. Where necessary, AAHK shall propose and implement any further mitigation measures in consultation with EPD and AFCD. 6. AAHK shall continue to monitor the incident until the spill is completely dispersed / cleaned up and adverse impacts to the marine environment are no longer observed / detected (as confirmed by water quality monitoring results or other indicators as agreed with EPD and AFCD). There are no neighbouring residents (i.e. non-airport operations related personnel) located within or immediately adjacent to the 3RS project area that may be affected by spillage events arising from operation of the 3RS project. Hence no specific provisions for protecting neighbouring residents are required. ¡ Diagram of the site / premises plan, including drainage plan covering the affected facilities. All emergency incident handling personnel shall be familiar with the storage locations of Spill Control Equipment. Regular inspections and stocktaking of the resource materials in the spill handling should be taken at least every six months and after each spillage event by assigned qualified personnel (e.g. AAHKs’ Term Maintenance Contractor and/or individual airport tenants). Regular checking and testing of the functioning and validity date of the spill response resource materials should also be carried out at least annually by assigned qualified personnel of AAHK / respective airport tenants. For non-aircraft related spills, appropriate training shall be provided by the individual tenants / airport operators (covering their respective premises and in accordance with their individual response plans and procedures) as part of their induction / regular training requirements. Generally, relevant airport staff whose work involves using / handling / storing chemicals and hazardous materials / chemical wastes or fuels shall be introduced to the SRP during environmental induction trainings for such staff. During the induction trainings, a demonstration of the containment methods and equipment shall be carried out. Refresher trainings shall be conducted regularly and at least once every year. Examples of spill related training topics are shown in Table 8.3. Training records for AAHK staff and AAHK’s Term Maintenance Contractor staff shall be updated and kept in the Operational Emergency Spill Response Plan. For spills related to aircraft operations, additional emergency response training would be conducted to ensure the refuelling crews are conversant with the contingency and spill response procedures as specified in AAHK’s Emergency Procedures Manual and in accordance with respective Franchisee spill response plans. i. New employees working on refuelling operation shall receive training on spill response and other emergency response procedures prior to commencing active duty. ii. Simulation exercises to test the equipment, knowledge, skills and response times of refuelling personnel on spill response shall be held at least once a year. iii. A large scale spill simulation exercise in combination with emergency services organisations and relevant Government Departments shall be held at least once every 2 years. ¡ Findings and recommendations from follow up investigation, where applicable. For major spill incidents that enter the marine environment, the spill investigation report shall be submitted to the Regional Office of EPD within one week. For any significant spill entering the marine environment, water monitoring results shall be provided if water quality monitoring was undertaken as part of the incident response. Final records should be kept and maintained by the relevant responsible parties and AAHK for spillage incidences that occurred in the operating 3RS airport. Additional improvement or mitigation measures recommended by the spill investigation report should be included in the Operational Emergency Spill Response Plan. Table 8.4 provides the names and telephone contacts of various parties who should be contacted in case of a spill incident or emergency. As for the existing operation, it is expected that AAHK’s Airport Operation Control Centre would be the central contact point for handling emergency spillage incidents and for correspondences with relevant Government departments. The emergency contact list shall be reviewed before the 3RS operation and at least annually afterwards. Any changes should be amended and notified to all relevant parties of AAHK / airport tenants immediately, and the updated contact list should be provided to all relevant government departments within one week of amendment. ¡ Description of the construction works under this contract / JV, including the scope, locations, types of construction activities, and programme. ¡ Potential for spills associated with this contract / JV’s works / activities. ¡ Specific organisation of the emergency team for this contract / JV, including description of roles and responsibilities. ¡ Organisation chart of the emergency team for this contract / JV. ¡ Specific procedures for storage, transport and use of fuels / oils, hazardous chemicals and construction materials to be implemented under this contract / JV. ¡ Specific spill prevention measures for fuels / oils, hazardous chemicals and construction materials to be implemented under this contract / JV. ¡ Details of the lines of spill reporting, including parties to be notified under different spill conditions and responsible parties for different actions. ¡ Details of the spill response procedures to be implemented for different types of spills under this contract / JV. ¡ Details of the specific procedures for protecting marine mammals / sensitive receivers that may be affected by this contract / JV (for spills that may enter the marine environment). ¡ Details of the spill response training for construction workers and emergency team members / spill cleanup crew under this contract / JV. ¡ Specific types and quantities of spill response equipment available for immediate deployment in the event of a spill and their on-site storage locations for this contract / JV. All contract-specific SRPs shall be submitted to the AAHK and ET for review and checking to ensure the contract-specific SRP conforms to this Plan and meet the requirements of EP Condition 2.16. All contract-specific SRPs shall be certified by the ET Leader and verified by the IEC before commencement of construction of individual contracts.